Located in the space once occupied by Thai eatery Wild Orchid, Nakkara is a mere stone's throw away from such LA heavy hitters as Animal and Angelini Osteria. 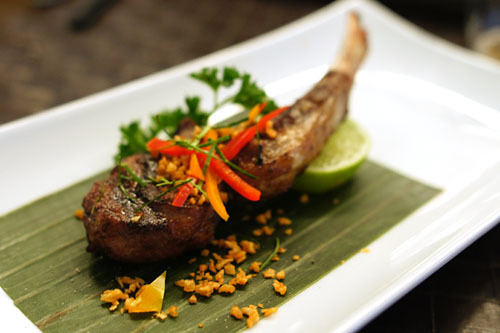 Like its predecessor, Nakkara is Thai at its core, but subscribes to a more fusion-y approach, with Chinese flourishes here and there, a style that the restaurant describes as "Thai inspired." 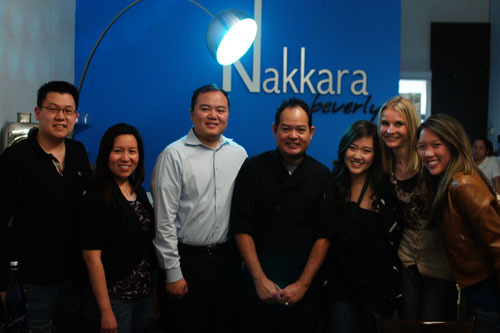 The story of Nakkara begins with Head Chef and Co-Owner Suthum "Kevin" Sukcharoen. Sukcharoen, a native of Thailand, underwent no formal culinary training; rather he learned the art of Thai cookery from his mother. Though he started out as a school teacher, the yearning to cook eventually took over, and the Chef began his culinary career working at various restaurants throughout Bangkok. He eventually emigrated to the US, settling in Los Angeles. From here, he started his first Thai eatery in the San Fernando Valley, and, to this day, Sukcharoen still lends his talents to Kinnara Thai, a well-regarded place in Van Nuys. After achieving some moderate success in the SFV, he sold the restaurant to a family member and set up shop on Beverly, partnering with Paul Burachati and husband-and-wife team Toon and Amy Vinyuwonge. In fact, it was Toon who first contacted me to do a special tasting at Nakkara. From here, we organized a group dinner, inviting along Amy of The Roaming Belly, Christina of Food Je T'aime, Danny of Kung Food Panda, Diana of Diana Takes a Bite, and Felicia of The Food Ledger. Sukcharoen and his Sous Chef Supannee Noochoo created this custom 13-course meal for us, which included a couple off-menu items. Note that Nakkara doesn't have a liquor license, so it's a strictly BYOB affair. Corkage is nominally $5, but was waived for this dinner. Click for a larger version. Since this was a bring-your-own event, I stopped by my local BevMo right before the meal and grabbed a quartet of bottles that I thought might go well with the food. 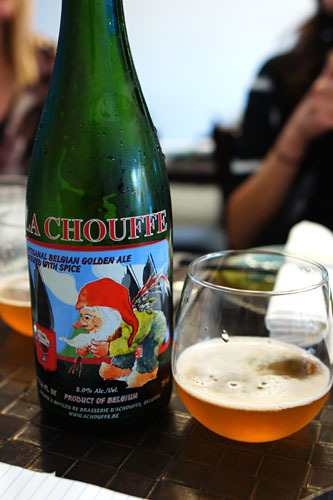 We began with beer, specifically La Chouffe [$9.99], a Belgian pale ale from producer Brasserie d'Achouffe. It's been one of my favorite brews ever since I tasted it for the first time at Leatherby's Cafe Rouge, and once again, it demonstrated its signature fruitiness backed by plenty of spice and herbal flair. Even the non-beer drinkers at the table appreciated this one! 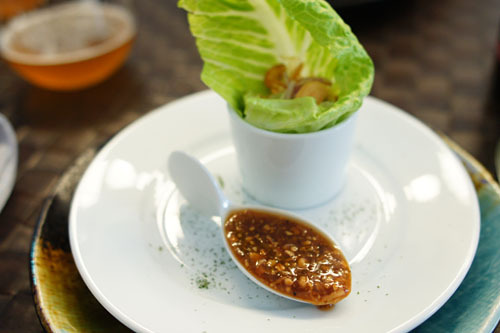 Serving as a sort of amuse bouche, a miang kham is a type of traditional Thai street food from the northern reaches of the country. 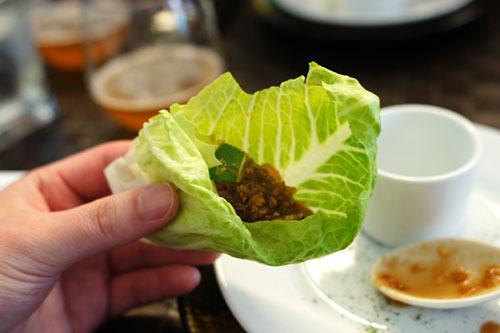 Nakkara's version utilizes toasted coconut, cashew nut, dried shrimp, diced lime, ginger, Thai chili, and red onion, all wrapped in a lettuce leaf. To this commixture, we added a thick sweet mieng sauce with tamarind, peanut, and roasted coconut. Eating this in one rather big bite, the flavors were sweet and nutty at first, but then, with more mastication came the sourness of the lime, countervailed with the saltiness of the shrimp and heat from the chili. A refreshingly complex start to the meal. Looking at this course on the menu, I was afraid that the filet would turn out overly tough. Thus, I was pleasantly surprised when I discovered how tender the grilled beef was, and how well its flavors were augmented by the vegetal, subtly sweet relish of the bell peppers. 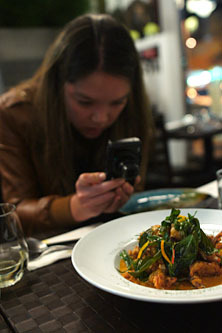 The green curry sauce, meanwhile, added further depth to the dish, while leaving a lingering spice. As I suspected that it would be, the lamb was a tad overcooked, but fortunately, it was still tender, flavorful (though not particularly "lamb-y"), and even a bit fatty. I appreciated the lightly charred exterior, which threw a bit of bitterness into the fray, as well as the zestiness imparted by the crispy garlic and slivers of pepper. The use of lime juice was a nice touch as well. 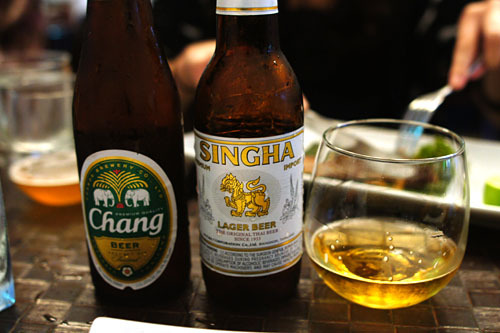 With the Chouffe dispensed with, Toon graciously brought out some complementary Thai beer--Singha and Chang--for us to enjoy. 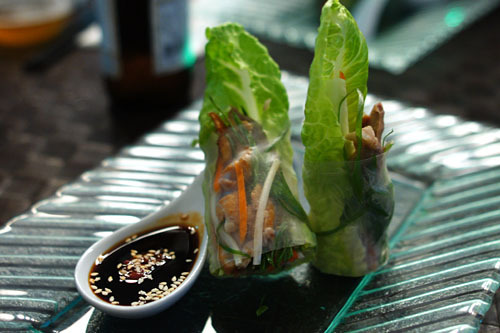 Here we had Peking roast duck, carrots, bean sprouts, and heart of romaine, all rolled up nicely in a rice paper wrapper. Eating the rolls alone, I appreciated the true to form sapor of the Peking duck, but it was masked somewhat by the copious amount of accompanying vegetables. The application of the paired Hoisin-Sriracha dipping sauce added weight to the levity of the rolls, but I would've liked a bit less sugariness. The fancifully-named "Big Surprise!" was arguably the biggest hit of the night. 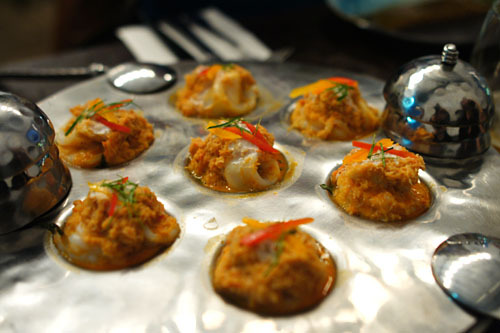 One of Sukcharoen's signatures dishes, we had here a steamed mixture of shrimp, crab, and squid, drenched in coconut milk and a red curry paste. I loved how the savor of each seafood element was clear and distinct, and how the initial sweetness of the coconut led to the delicate spiciness of the curry, all under the overarching tang of basil. Time for some bubbly! 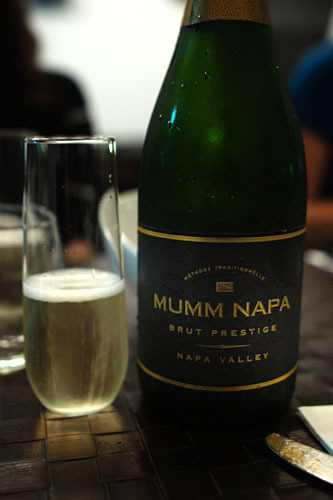 The Mumm Napa Brut Prestige [$18.99] fit the bill nicely, sort of a prototypical California sparkler: sweet but not overly so, with a nice toasty backdrop for depth. We were given a choice of soups. The first was this tom yum goong, the heart of which was a heady broth of herbs, lemon grass, kaffir lime leaves, galangal, fresh lime, and chili. 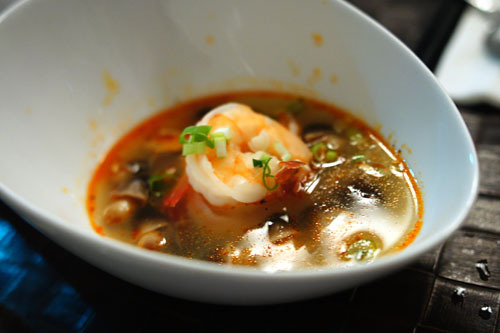 I enjoyed its classic, contrasting sour and spicy flavors, which played nicely with the relative mildness of the shrimp and the slight earthiness of the mushrooms. 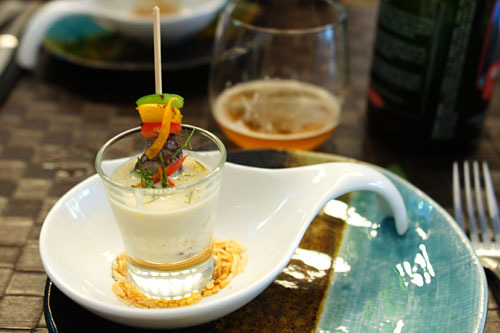 Next was the tom kha gai, a chicken and coconut milk hot and sour soup with herbs, galangal, lemon grass, and chili. 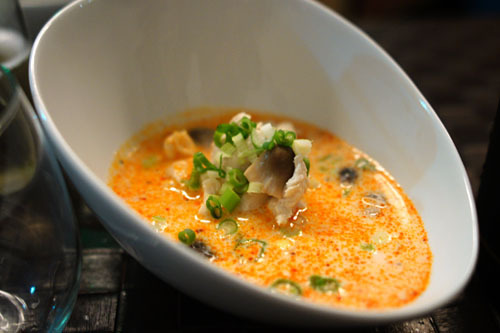 Since the two soups do share several common ingredients, the hot, tangy smack of the tom yum was present here as well, where it was joined by the sweet backbone of the coconut milk. 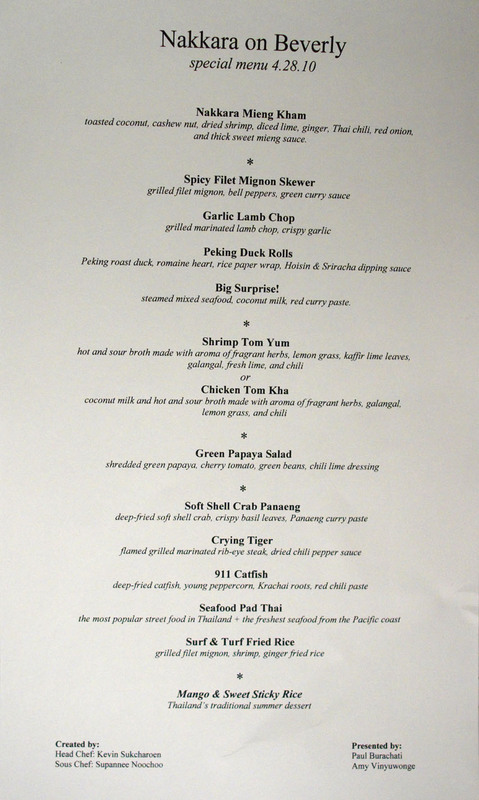 We were torn on which soup we preferred, but I'd have to go with the tom kha for its great interplay of coconut and herbal flavors. 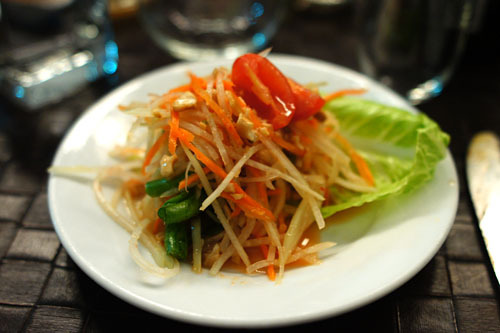 This was som tam, a spicy salad made from shredded unripened green papaya, cherry tomato, green beans, and chili-lime dressing. I appreciated the crisp, crunchy, juicy consistency of the papaya and its subtle sweet succulence, augmented by the tomatoes and green beans, while the use of chili and lime gave things a lively, piquant counterpoint and a great lingering spice. 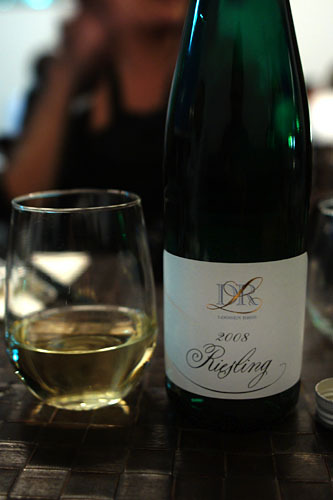 Riesling is oft recommended to pair with Thai food, so here we have the 2008 Dr. Loosen "L" Riesling [$12.99], a lovely, light, bright wine with quintessential flavors of stone fruit and citrus intermixed with a delicate minerality. 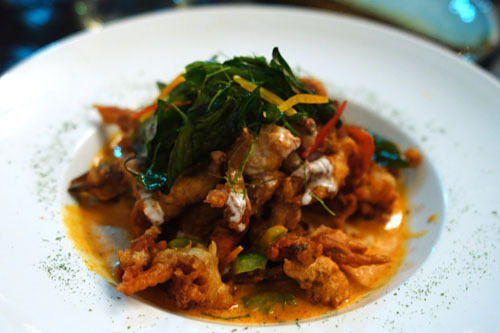 The first of our "main courses" was a deep-fried soft shell crab dressed with crispy basil leaves and a panaeng curry paste. I enjoyed the delicate spice of the panaeng, accented by basil, and how it countered the crab's natural sweetness. However, I wished that the crustacean's inherent flavor was emphasized more--it seemed a little lost. 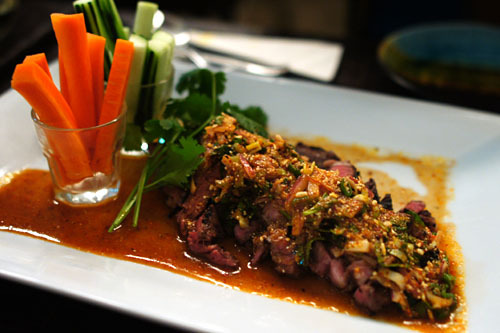 Also known as suea rong hai, this is a Northeastern Thai dish of grilled marinated rib-eye steak, served with a dried chili pepper sauce (nam chim chaeo) and crudités. I quite liked its tender, pleasingly rare consistency, as well as the great tanginess imparted by its zesty marinade. A table favorite. 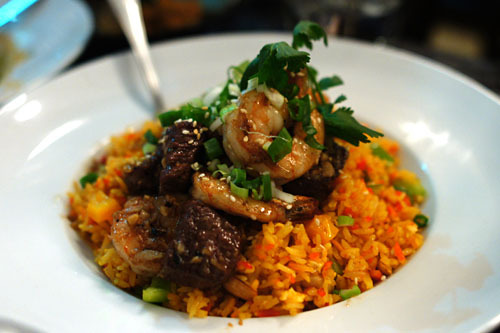 Thai-style ginger fried rice (khao pad) was kicked up a notch with the inclusion of grilled filet mignon and shrimp. The beef was actually remarkably tender and flavorful, and the shrimp was nicely supple too, demonstrating plenty of its signature sweet brine. 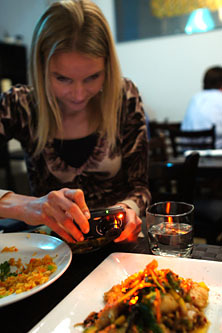 The rice itself, meanwhile, proved to be quite pleasant as well, with just a touch of gingery astringency. Next up was deep-fried catfish, accompanied by young peppercorn, krachai (a ginger-like root), red chili paste, and more of that ubiquitous basil. I'm generally not huge on catfish, but I did admire the tender, flavorful filets, accented by the powerful application of peppercorn and basil. The peppercorns were actually quite sharply pungent, so I had to be careful not to overuse them. Beaujolais is a red white that drinks like a white--sort of the perfect summer wine for quaffing--so I thought that it might be a good fit here. 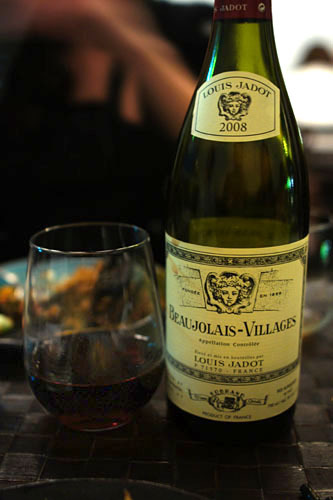 I chose the 2008 Louis Jadot Beaujolais-Villages [$13.99], a lovely, fruity wine with just enough tannic complexity to make things interesting. Finally, we were presented with pad thai, perhaps the most famous dish to have come out of Thailand (but which, ironically, is not truly Thai in origin). 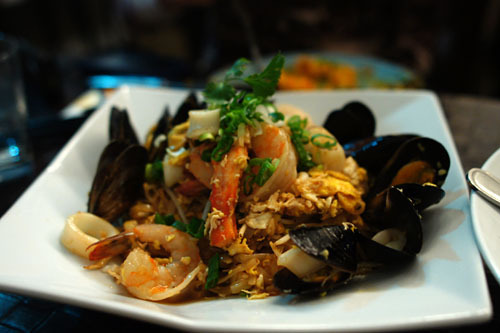 A plethora of seafood--crab, shrimp, mussel, scallop, squid--was added to this prototypical Thai dish, making for a luxurious eating experience indeed. I appreciated how the briny essence of the seafood was preserved here (though unfortunately, the mussels were clearly overcooked), and how it played with the fortunately not-too-sweet noodles. 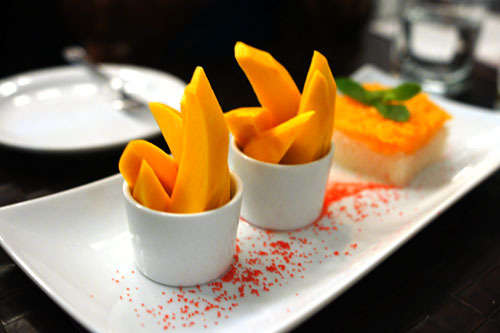 Khao niao mamuang, a quintessential summer dessert, is a dish of coconut-cooked sticky rice served with mango. I loved the rich, ripe, sugary mango slices, and their interaction with the warm, tempering rice. Easily the best version of the dessert that I've had. The requisite group photo: Kevin, Amy, Danny, Chef Kevin Sukcharoen, Christina, Diana, Felicia. 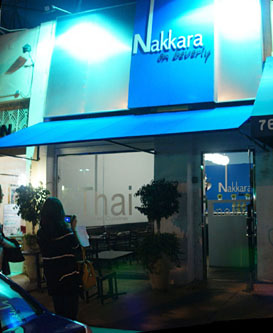 Some have complained that Nakkara's food is over-Americanized, over-gentrified even. 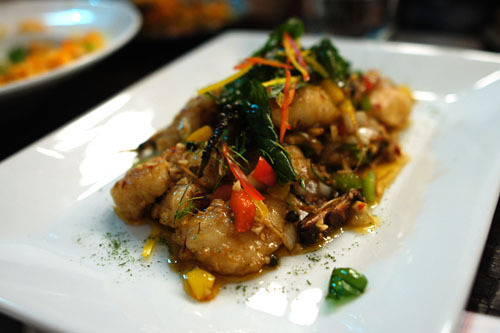 Indeed, there are real Chinese influences, and even some Cal-cuisine flair, but the dishes, for the most part, don't forget their Thai roots, with some of the courses being straight up textbook Thai. At the end of the day, the cooking is smart, clean, clear, focused, and most importantly, quite tasty. Can't go to Jitlada all the time, right? Thanks Kevin! Great reviews. Looks like a few of you guys have it out already. I think I'll have it done by the weekend! Looks like I missed out..
What a nice modern place. Is the Big Surprise served in a escargot dish or something similar? The plating looks quite interesting to me. Certainly a "surprise"! mmmmm...once again, thanks! and an "a++" to you for bringing the wines that brought out the glow. Great review! Everything looks delicious... and it did look like a fun group to dine with! Hah "the non-beer drinkers at the table" - that would be me! ;) I was surprised how much I did enjoy it! Again, such a great meal and so glad I was able to make it. Jt was really a fun night! were the wine prices by the glass or by the bottle? not bad if by the bottle for a restaurant wine list! wow looks delicious how much did it come up to?? 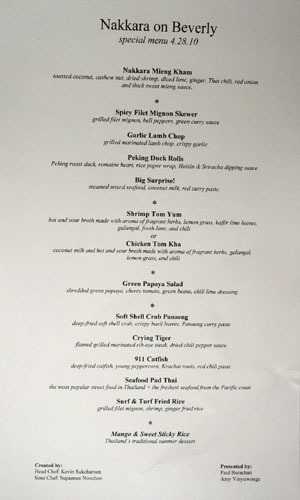 the food looks great, but i was shocked that you paired thai with the louis jadot. Felicia: You're quite welcome! I'm surprised--we all got our posts out in record time. Collier: Thanks for that insight. 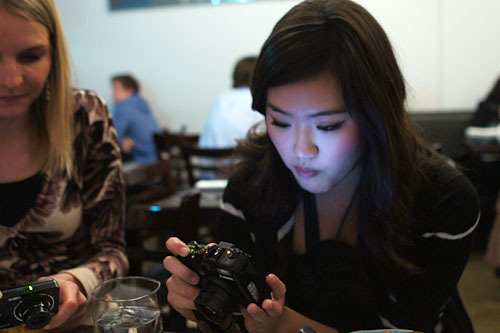 Any dishes that you're particularly fond of? Cynthia: You did miss out! I'll let you know next time I do something like this again. Amy: The glow is a must--I wouldn't have it any other way! Cathy: Definitely. ;) I'm looking forward to your upcoming Spain posts. Diana: Glad I could help turn you on to beer! I also wasn't too keen on beer at first, but La Chouffe was the one that got me interested.